Microsoft Teams and Skype for Business are both part of Office 365 that provide chat, phone conversations, voicemail, meetings, files, and apps together in one place. They both require Phone System licenses to enable call control and PBX capabilities in the Office 365 cloud. The license is available as an add-on or as part of the Enterprise E5 licenses. Licensing details are at Skype for Business add-on licensing. A Phone System license allows you to replace your existing PBX system with a set of features that include voicemail and Auto attendants, which let people who call your business navigate a menu system to get them to the right department, person, or the Operator. Auto Attendants can be used with either Teams or Skype for Business. You create an Auto Attendant system for your organization using the Skype for Business admin center. If you are asked to set up an Auto Attendant, this article provides an illustration of planning and implementing Auto Attendants for a hypothetical small business. It's not a one-size-fits-all solution, but it is a good starting point. Set up Phone System in your organization with a Calling Plan to provide phone numbers to your users. Reviewed What are Cloud Auto Attendants? to get a better understanding of the Phone System features that can interact with an Auto Attendant. Also, you'll be pleased to discover that most of the planning and design portion can be done using a white board or index cards: having a good plan isn't technically demanding. VanArsdel, Ltd. is a small town law office with three lawyers and a total of 15 employees, each of whom already has Office 365 and a Phone System voicemail box. Q: Who are the people in the business? Q: Why are the customers calling? Your Auto Attendant should address the needs of the customers, and the most frequent customer needs should get addressed first. Since Julie Wolfe is acting as the Operator for the office until the Auto Attendant system is implemented she should be in the best position to tell you what customer needs generate calls. Q: What special considerations does each job function in the office have? Billing questions can be handled by either of the clerks. Given that, it’s okay to create a call queue that will send the call to whichever line is not already busy. Q: What language requirements do the customers have? Asking Julie Wolfe, we discover that there were only two callers in the whole week for whom English seemed to be a second language. They functioned well enough in English to make their enquiries, and they didn’t seem to speak the same native language. Confirming this with the business partners, the lawyers, the need for bilingual or multilingual prompts was not seen as a priority. Q: What are the business hours, non-business hours and holidays? You may want distinct initial greetings for business hours, after-hours, weekends, holidays, and so on. Q: For each of the job functions in the office, what issues do they handle for customers? You may be surprised by what issues the various office workers usually handle. For example, it’s possible that Julie the receptionist can answer many questions you might have assumed should be routed to the billing department or Valeria the office manager. Before we look at our specific example, let’s look briefly at some more general design guidelines and basics. It's a good idea to have alternate initial greetings for calls taken outside business hours, or on holidays or weekends. Put your most frequently used options as early as possible in the first set of menu options. If possible, reserve zero in the first menu for a transfer to a live Operator, and mention it first in the scripts. Have the menu repeat at least once if nothing is selected, and if there still isn't a selection, transfer the call to a live Operator rather than having the call disconnect. By default, Phone System will replay the menu three times, then if an Operator is configured the call will transfer to the Operator or if no Operator is configured the system will hang up. Given that, it's important to configure an Operator for your Auto Attendant system. Use multilingual prompts, but put the secondary language or languages at the end of the first set of options. You’ll need to create a separate set of nested Attendants for the secondary language. Take a few extra minutes to flow chart the options you want to create, and make sure you aren't creating opportunities for users to go around in circles in the option menus. It should ideally be possible to get connected to a person or their voicemail in three menus or less. Create a nested Auto Attendant with more than 5 choices. If you do, you'll likely confuse your callers and force them to repeat the menu. Use reserved menu option numbers or keys as menu options. The keys * (Repeat) and # (Back) are reserved by the system and can't be reassigned. If speech recognition is enabled, pressing * will correspond with "Repeat" and # will correspond with the "Back" voice commands. For each person with a voicemail account in the business, write their name and phone number on a sticky note or 3x 5 index card. You may need several notes for the employee who will be the Operator. If you have several colors of note available, it might help to distinguish users and Auto Attendants at a glance. Mark one note as the Main Auto Attendant, which will include a business hours initial greeting, an after hours greeting, and a main menu. You'll probably also want an Auto Attendant to represent the hours and location recording (if you’re choosing to use one), and additional Auto Attendants as needed to cover the needs of your callers. If possible, use a different color of note to represent Auto Attendants. Place the main Auto Attendant note on your board space, if any of the top options go directly to a single employee put their note to the right of the note representing the attendant. It’s unlikely all the options will fit on a the Main Auto Attendant menu, so think about which additional attendants might be needed and how they might nest under the main attendant. If you have an option that leads to a call queue, create a note using a third color, place it below and to the right of the Attendant that connects to the Call Queue. Place notes representing the users in the queue to the right of the note representing the queue, or over the top of it (whichever is clearer to you). The most common reason for calling was to schedule appointments, so it was listed first. The other reasons to call are given as options in descending order of their use. There are usually 3-4 options per menu in this example. While Phone System supports menus with up to 9 options, most users won't be able to keep track of more than 5 options without getting confused and needing to repeat the menu, which wastes their time and annoys them. The lawyer, paralegals, and billing menus can arguably be replaced with Call Queues. The main reason we've used an Auto Attendant is to keep our implementation focused on Auto Attendants. Actual implementations would probably use Call Queues. See Create a Cloud call queue for more about Call Queues. Eventually, every employee gets matched with an Auto Attendant option in this design. This might not be what you choose to do, you may want a much simpler system with fewer options. If that simplicity is important, you can plan to enable the Dial by Name option and remove one or more of the nested Auto Attendants that mention specific employees by name. The example assumes that after hours, callers will get a message letting them know the business is closed, then only leaves them the option to leave a message to the operator. You could decide instead to send after-hours calls to the normal menu tree, if you'd prefer. In this example, we can assume we've enabled the Dial by Name option and it's expected that callers either know the name of the person or they're okay with talking to anyone in that job category. Since this is an optional variation, the later stages will assume we're implementing the first diagram. 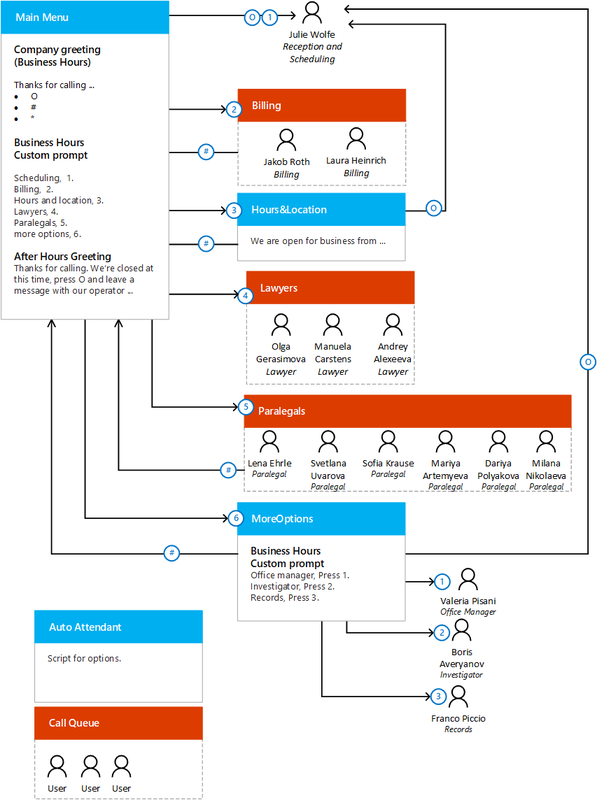 If you have Visio, you could use that to visualize your design. 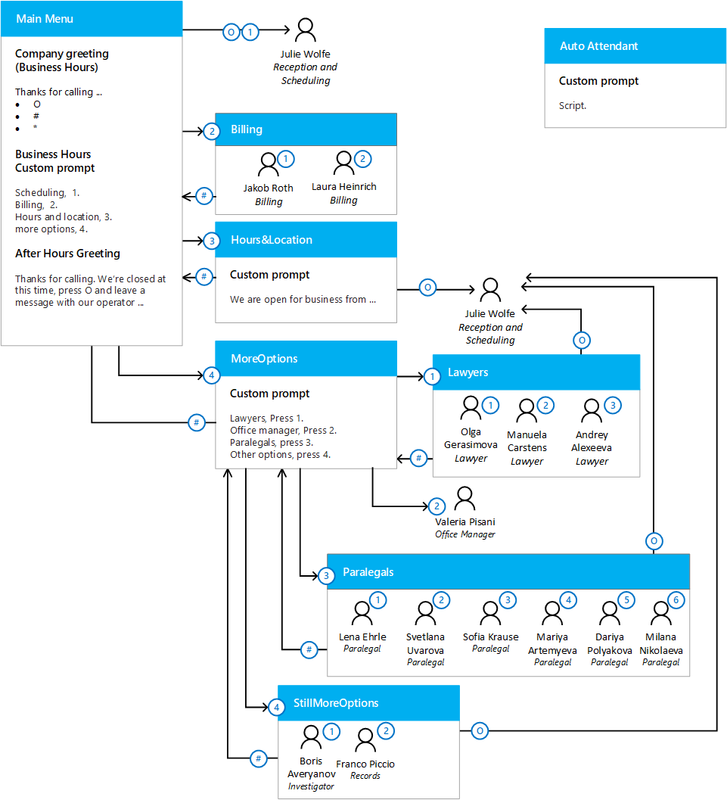 The Visio file containing the diagrams above is available for download. Greet and thank the caller for contacting you. Keep this short, no more than three sentences and under 30 seconds. If your web site offers self-service options, mention it but otherwise present choices and options as soon as possible without being abrupt. Use multilingual prompts, but put the secondary language or languages at the end of the first set of options. Present the option, then the number to press ("For Sales, press 3"). When the caller hears the option they want, their attention immediately focuses, so that's the time to tell them what will get them there. Make sure the voice for the prompts leaves the impression you want and is clearly understandable. Phone System has a built in text to speech engine which gives you the option of entering your final text and deciding for yourself whether it's conveying the impression you want. If not, recording an audio prompt is fully supported. If the voice mumbles, sounds condescending, or has other issues, keep looking. Mention significant changes to your option structure when that happens, but don't leave that part of the greeting active for more than a month. If you have frequent updates and expect that to be the case most of the time, just omit it from the script. Clutter the initial greeting with hours of operation or your business address. Make those available as a choice in the first menu if it's frequently requested information, but keep the initial greeting short and sweet. Say please or use other pleasantries over and over. Just get the callers to the option or person they need as efficiently as possible. Include "http://www." when mentioning a web address. It's just a poor use of script time. Use abbreviations like St for street or CA for California. Spell them out in the script and say the whole word in the recording. Text to speech engines don't usually do well with abbreviations. Include sales information in the scripts, you'll annoy your callers. Let your sales force take care of that sort of thing. And finally, if your company has a slogan, think twice about including it in the script at all. Chances are your callers have heard it before if they're calling you. If you do include it, put it somewhere it brings the Auto Attendant experience to a close, like when transferring to an individual's desk line or voicemail. If you’ve had a slogan or tag line for a long time that many of your customers know, it might or might not be worth including. The "golden rule" here is to connect the caller to a person as efficiently as possible. These scripts reflect the design we chose earlier, and the suggested guidelines for writing Auto Attendant scripts. Thanks for calling VanArsdel, Ltd. At any time you can press zero to transfer to the Operator, press star to repeat the menu, or press pound to return to the previous menu. (Optional, if Dial by Name will be enabled) If you know the name of the person you're calling, say their name at any time and you'll be transferred to them. Thanks for calling VanArsdel, Ltd. We’re closed at this time, press zero and leave a message with our Operator. We’ll call you back when we return to the office. For scheduling, press 1. For billing questions, press 2. For hours and location, press 3. For more options, press 4. Available options not mentioned: zero, *, and #. To speak to Jakob Roth, press 1. To speak to Laura Heinrich, press 2. This script could be omitted if you redesigned using Call Queues. We are open for business from 8:30am to 5:30 pm, Tuesday through Saturday. Our address is 1234 Green Street near Central avenue, Planktown Pennsylvania, directly across from City Hall. To speak to one of the lawyers, press 1. To speak to the office manager, press 2. To speak to one of the paralegals, press 3. For other options, press 4. To speak to Olga Gerasimova, press 1. To speak to for Manuela Carstens, press 2. To speak to for Andrey Alexeeva, press 3. To speak to Lena Ehrle, press 1. To speak to Svetlana Uvarova, press 2. To speak to Sofia Krause, press 3. To speak to Mariya Artemyeva, press 4. To speak to Dariya Polyakova, press 5. To speak to Milana Nikolaeva, press 6. To speak to our investigator, press 1. To request a copy of your records, press 2. The information needed to implement the design in the earlier diagram is presented in the tables that follow. The implementation uses text-to-speech for the scripts. Phone System has a built in text to speech engine so you the option of entering your final text and deciding for yourself whether it conveys the impression you want. If not, it's up to you whether to record your own prompts using Sound Recorder in Windows or have a professional voice-over artist use your scripts to record .wav files. As mentioned earlier, your implementation could easily involve Call Queues, which could be used in place of the lawyer, paralegal, and billing Auto Attendants below. A Call Queue would transfer the call to any of the available lawyers, paralegals, or billing clerks. See Create a Cloud call queue for more about Call Queues. If you choose to do this, you'll need to create a valid Call Queue before creating an Auto Attendant menu that refers to the Call Queue. 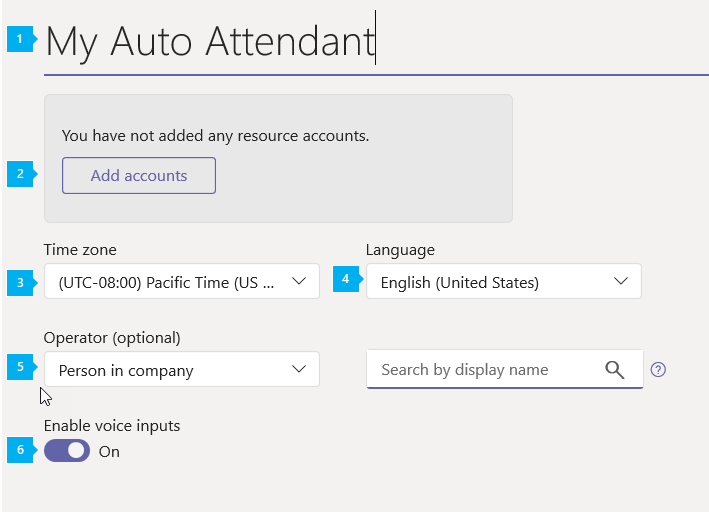 Your account must have Admin priveleges: in the Microsoft Teams admin center, click Legacy Portal then select Call routing > Auto attendants, then click Add new. The following tables show values to enter in the user interface screens. Each table represents a user interface screen. Create the following Auto Attendants in the following order and set their general information, then once the main and nested Auto Attendants are all created, edit them to set the Business hours call handling. A nested Auto Attendant needs to already exist when you link to it in another Auto Attendant's menu choices. Only the main menu, named VanArsdel, Ltd. needs an assigned Phone Number or a Company Greeting. Enabling Speech recognition will enable voice commands for a given menu. It will also enable callers to say "Operator" and get transferred directly to the Operator. The default for this screen is 24/7. The Company Greeting usually only needs to be set on the main menu, with a nested Auto Attendant we want to flow straight through to the Custom Prompt. After hours call handling for the main menu The After Hours call handling screen is very similar to the Business hours Call handling screen. What happens to the calls after the greeting? Redirect call- Send to: Person in your company: Julie Wolfe. The call will go to voicemail when not picked up. While setting up your after hours call handling for the Main Auto Attendant, you could choose to create the same menu options used in the business hours call handling screen. Doing this would allow the after hours callers to navigate the same menus as business hours callers. It's a matter of preference which approach you choose. Set up holidays and the dial scope as you see fit, and save the Main Auto Attendant. Nested Auto Attendants don't usually have phone numbers associated or a company greeting, and they only get accessed as directed in the main Auto Attendant. Set up the General Information for the nested Auto Attendants using different names but the same Time Zone, Language, Speech Recognition and Operator settings. Set the business hours call handling as shown for each Auto Attendant. 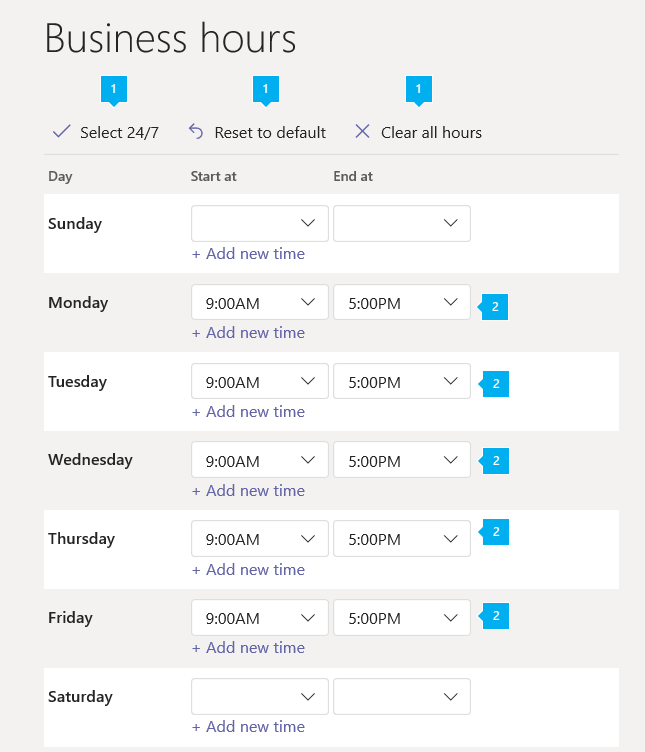 You can leave the business hours for a nested Auto Attendant set to the default, 24/7. You can also choose to leave the holidays and dial scope settings at their defaults for nested Auto Attendants. You could put your hours and location message in the Company greeting, and then after the greeting repeat the main prompt and configure the same options as used in the main menu. See the step-by-step implementation details for Cloud Auto Attendants at Creating an Auto Attendant for more detail on the options available in these screens. After you have saved your Auto Attendant, it will be listed on the Auto Attendants page of the Admin center. This will allow you to quickly see some of the options that you have set up. The best way to test the implementation is to call the number configured for an Auto Attendant and choose options to navigate to each of the auto attendants you've just created. You can also quickly place a test call to your Auto Attendant by using the Test button in the Action pane. If you want to make changes to an Auto Attendant, select the Auto Attendant, and then in the Action pane click Edit.